You may have seen examples of Matthew Shelton‘s lightboxes behind the back bar of Northside Tavern, or at The Lodge in Dayton KY, or previously on exhibition at NVISION, but here’s your chance to see new work, and meet the artist, at the Art Reception for Lightboxes by Matthew Shelton, at NVISION this Saturday. There are even two lightboxes that are collaborations with Jad Fair! * All exhibited works are available for purchase, and will be on display through the remainder of the year. With prices from $200-$1000, we’ve got payment plans available too! Matthew Shelton was born in South Carolina in 1974. Following two years at Berry College in Rome, Georgia, he pursued a Bachelor of Fine Arts at the Art Academy of Cincinnati. During his years in Cincinnati, he pursued both music and art with equal intensity. As leader of his bands The Cat Lovers, Me or the Moon, and M.Shelton’s Picnic, he garnered praise for his inventive approach to folk music, using both traditional solo guitar, and more idiosyncratic approaches to songwriting and performance by playing the African mbira, and forming odd chamber music groups featuring bassoon, bass clarinet, piano, saxophone, and strings. Along with his musical output, he made and exhibited a varying body of artwork during his time in Cincinnati. His whimsical, folk art and comic book influenced Women and Kitties series found considerable attention in non-traditional venues like bars, hair salons, video stores, and cafes. In 2004, Shelton began his groundbreaking lightbox work that continues to this day. 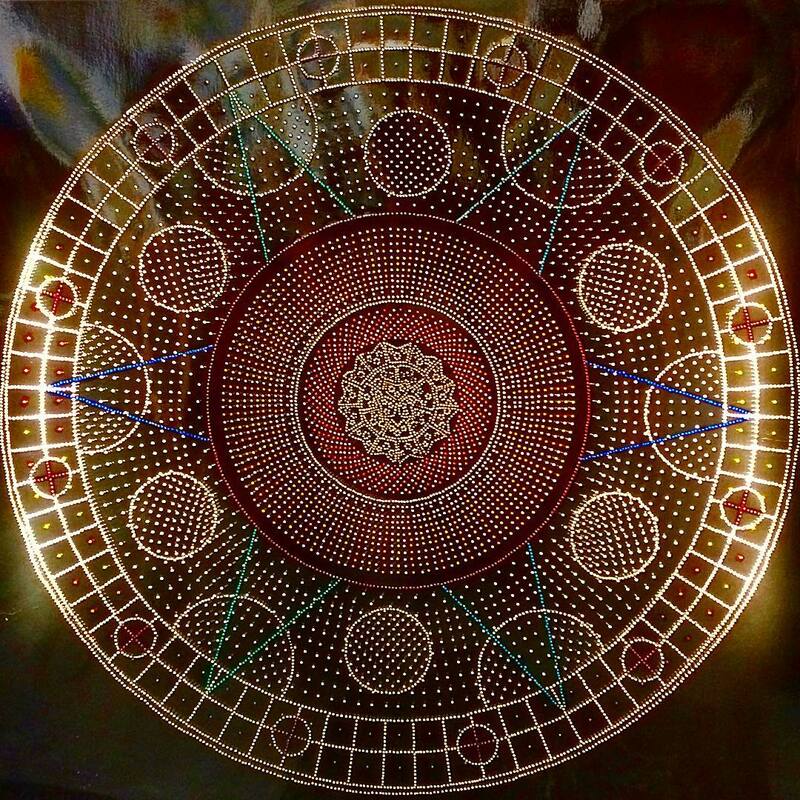 Using a technique of the artist’s own creation, these works feature a meticulous attention to detail, with patterns comprised of thousands of holes, creating mandala-inspired, jewel-like images of light and pattern. These works have been exhibited in numerous venues since, thrilling both seasoned art connoisseurs and casual viewers. 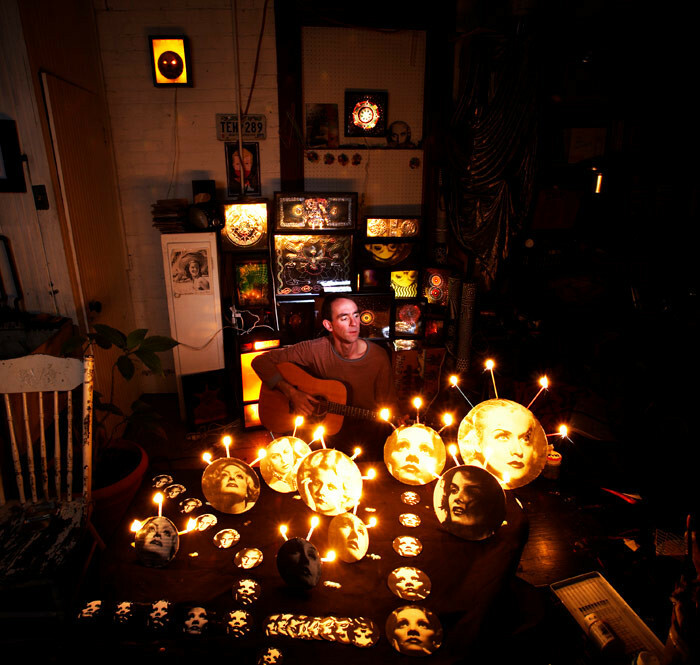 In the summer of 2010, Shelton relocated to Chicago, and continues to create and exhibit his lightboxes in his new home city. His music projects continue as well, with a Chicago chapter of the Picnic, and continued solo work. In 2015, he formed ExtraOcular, a trio that currently features mbira, guitar and cello. Also in 2015, Shelton made the leap into video-based work and has cultivated a wild and experimental psychedelic style that continues to evolve, making use of his years of work as an artist and musician in a completely different medium. Learn more about Matthew Shelton’s multi-media talents and artistry at flexyourlovemuscles.com. We’ve rearranged the floor plan of the shop and edited the merchandising throughout! General consensus so far says it “feels bigger,” and it’s “easier to navigate.” This new arrangement will continue to go through some tweaks as we improve upon the flow and presentation, come check it out! We are available for clothing alterations and repair jobs, no appointment necessary during weekend store hours. If you need help through the weekdays, please get in touch via social media, or email [email protected], or of course, leave a voicemail at 513-542-4577.